L’Hippocampe is a small, yet fantastic 5 star campsite that lies within 4 hectares of beautiful grounds at the foot of the Pyrenees. This stunning family friendly campsite is especially popular with those families with smaller children who want lots of things to do on-site and nearby whilst having a peaceful area where they can relax. Although fairly small, L’Hippocampe offers a great range of facilities and activities on-site whilst also offering the availability of all of its sister campsites facilities and activities. Right opposite L’Hippocampe you’ll find La Sirene campsite which is a larger and more livelier campsite. One of the great benefits of staying at L’Hippocampe is that you get to use the facilities and activities at La Sirene along with the ones at L’Hippocampe. This means that you get the best of both worlds with double the campsite. If you’re looking for a campsite in the south of France near to the beach then you won’t be disappointed by L’Hippocampe. Located just over 1km away from the campsite you’ll find a glorious sandy beach which is perfect for families of all ages. The beach is easily reached by foot or bicycle however for those who don’t fancy walking you’ll find a mini train that stops outside the campsite and will take you straight to the beach. Back on-site at LHippocampe you’ll find a lovely pool complex that boasts a couple of lovely heated swimming pools, a jacuzzi, slide and sun terrace. Don’t forget though that you’ll also be able to use the massive pool at La Sirene next door. 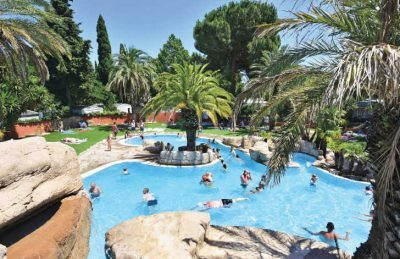 L’Hippocampe campsite offers a comprehensive selection of activities and facilities on site and also nearby to ensure you have a fantastic family holiday. On-site activities at L’Hippocampe campsite include table tennis, tennis, archery, mini golf, pony rides, trampolines, windsurfing, kayaking, boules, playground and cycle hire. Facilities available at L’Hippocampe campsite include WIFI, restaurant, takeaway, bar, groceries, gift shop, games room, animation team, washers and dryers. Accommodation at L’Hippocampe campsite includes a range of 2 and 3 bedroom mobile homes that are available from Eurocamp.